Pulse refers to a pressure wave that expands and recoils the artery when the heart contracts/beats. 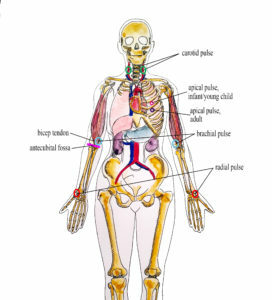 It is palpated at many points throughout the body. The most common locations to accurately assess pulse as part of vital sign measurement include radial, brachial, carotid, and apical pulse as shown in Figure 3.1. The techniques vary according to the location, as detailed later. The heart pumps a volume of blood per contraction into the aorta. This volume is referred to as stroke volume. Age is one factor that influences stroke volume, which ranges from 5–80 mL from newborns to older adults. Pulse is measured in beats per minute, and the normal adult pulse rate (heart rate) at rest is 60–100 beats per minute (OER #1, OER #2). Newborn resting heart rates range from 100–175 bpm. Heart rate gradually decreases until young adulthood and then gradually increases again with age (OER #2). A pregnant women’s heart rate is slightly higher than her pre-pregnant value (about 15 beats). See Table 3.1 for normal heart rate ranges based on age. The ranges noted in Table 3.1 are generous. It is important to consider each client and situation to determine whether the heart rate is normal. For example, heart rate is considered in the context of a client’s baseline heart rate. The healthcare provider also considers the client’s health and illness state and determinants such as rest/sleep, awake/active, and presence of pain. You can expect higher pulse values when a client is in a stressed state such as when crying or in pain; this is particularly important in the newborn. It is best to complete the assessment when the client is in a resting state. If you obtain a pulse when the client is not in a resting state, document the circumstances (e.g., stress, crying, or pain) and reassess as needed. Next: Why is Pulse Measured? What is Pulse? by Ryerson University is licensed under a Creative Commons Attribution 4.0 International License, except where otherwise noted.